If you’ve been using Mac OS X for a while, you’ve likely noticed that many software companies customize their CDs, DVDs, and disk images. These volumes open to a specific size and include an attractive background image neatly surrounding the icons of the volume’s contents. DMG Canvas helps you do the same thing with your own disk images and discs using a simple WYSIWYG editor, letting you focus on the design and appearance rather than on the normally tedious process. Using DMG Canvas, you specify how far from the top-left corner of the user’s screen you want the volume’s Finder window to appear, as well as the width and height of that window. I suggest a position about 40 pixels from each edge, and a maximum of 600 pixels in length per side; such a window should fit on any recent display. Then you drag a custom window background—which you can create in any image editor, such as Pixelmator, Acorn, or Photoshop Elements—or a digital photo into the Window Background image well. (You can use most image formats that Apple’s Preview can save to.) Alternatively, you can simply choose a color from the program’s color picker. 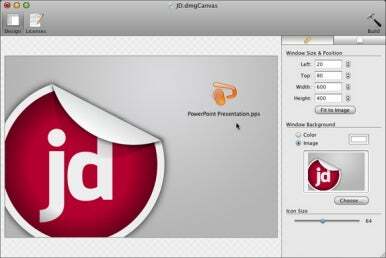 DMG Canvas shows you a live preview of what your opened window will look like. You then drag, from the Finder into the preview window, the files you want included on the disc or disk image. Each icon in the preview window will occupy the exact same location in the window that appears when the user mounts the volume. You can also choose the size of icons in the window using the provided icon size slider, and the Volume Icon button lets you add a custom icon for the mounted disc or disk image itself. When you're done, you just click on the Build button to create your customized Mac OS X disk image. You can then distribute that image as-is, or you can use OS X’s Disk Utility or a utility such as Roxio’s Toast to burn the image to a CD or DVD. The screenshot here shows an image I burned to a CD; the CD mounts on my desktop with the custom icon I set, and the Finder window is sized perfectly to fit my custom background image. DMG Canvas is dead-simple to use, and makes the otherwise-boring task of creating custom volume windows fun. One minor fault is that there’s no option to create a standard Windows-readable image. However, given that we’re Mac users, and cross-platform CDs typically don’t contain custom colors, image backgrounds or icons, that’s not a flaw worth losing sleep over.